We were only planning on opening two bottles during our dinner but we were way ahead of schedule so I went downstairs and came up with a CdP. I was going to grab a Montepulciano d’Abruzzo to stick with our Italian theme but I wanted our guest to experience something different…but not this different. This was not a great CdP. This is the second and probably last 2009 I’m going to buy. MobyGrape: 68. This smelled like a condom. I know I kid around a lot, but there were some serious eau de Trojan going on. And I really just couldn’t get past that. I was hoping it would go away after a while, or I wouldn’t notice it if I actually drank it instead of just sniffing at it, but that odor was still there and quite frankly ruined the whole thing for me. Fellas, if you’re trying to impress a special lady on a date by whipping this one out, she’ll pick up what you’re putting down, but don’t be surprised if she’s not into it. I feel like I’ve avoided so many obvious jokes in this review that I deserve some sort of prize. colonelgrape: 65. How can I follow that? In all honesty when we were drinking it I was sitting there trying my best to defend it since I love CdP. However thinking about it more and more it just simply wasn’t a good example at all. I didn’t get the condom smell, yes we opened one up to compare, but everyone else did. I can’t give much useful tasting info after a long night but I do remember it being much more tart and just plain. Good CdP should be complex, structured, and exciting…this was not good CdP. Guest Opinion: I was amazed at first wtih how accurate Mobygrape’s assessment of the condom smell was, but as I got more drunk, I started to question it, especially after smelling a real condom for comparison. I wasn’t too fond of the flavor, but it definitely improved when drinking with the meal, although that might have also been me just enjoying the food. 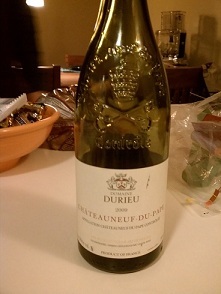 This entry was posted in Chateauneuf du Pape, France, Grenache, Mourvedre, Rhone, Syrah on November 26, 2012 by colonelgrape.